The teams event at the 2017 Australian Grand Prix provided great entertainment and quality with fierce battles played on the Extreme Pitches in Leichhardt. For the first time, 6 different Australian club teams were represented with teams coming from Perth, Brisbane, Melbourne and three from Sydney (Parramatta, Sydney TFC and Northern Falcons). In Group A, Melbourne TFC began their title defence with comfortable wins over Sydney TFC (3-1) and Brisbane Subbuteo Club (3-0). This meant the match between Brisbane and Sydney was effectively a semi-final playoff. In what was somewhat of an upset, the Brisbane lads pulled off a 3-1 victory with young Daniel Sirmai etching his name into Brisbane Subbuteo folklore. His 3-0 victory over Terry Koutzas proved the turning point in the first ever team win for Giuseppe Tardiota’s men. 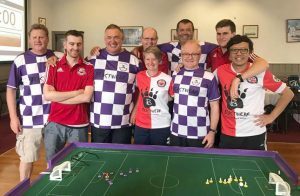 The Northern Falcons were the seeded team in group B and they made a strong start dispatching Perth Subbuteo Club (4-0). However, they faced a more difficult task in their game against crosstown rivals, Subbuteo Parrammatta, The final score was 3-0 with Parramatta’s Adrian Elmer nabbing a result against Jonathan Ball/Hermann Kruse. Adrian’s result proved to be vital as Parramatta had drawn with Perth in a thrilling contest earlier in the day (1-1). Parramatta progressed in second place on games difference, knocking the Perth lads out of the competition. This year we were able to include a 5th place game in which Sydney TFC won their first ever team game by defeating Perth. The semi-finals went down to form with the falcons knocking down Brisbane 3-1 and Melbourne defeating Parramatta 3-0. This meant the Grand Final would be a repeat of the 2015 Grand Prix between the Falcons and Melbourne TFC. The Falcons may have had the home state advantage, but Melbourne was running high on confidence, with their players having performed strongly in the individual event the day prior. There was great tension as the match began with the individual match-ups failing to produce a goal inside the opening 7 minutes. But the deadlock would be broken by Melbourne’s Singapore International, Benny Ng, and soon the goals were flowing. Benji Batten went a goal up against Dettre and Paul mercer took the lead over Hermann Kruse. The exception to the trend was Eliot Kennedy who stunningly took the lead against Peter Thomas. Thomas equalised before the break but this gave the Falcons much needed confidence going into the half time break. Down 3-0 at halftime, the Falcons were up against the wall and things got little better as Peter Thomas took the lead against Eliot. Paul Mercer and Benny were able to stretch their leads out and despite a late flurry from Hermann Kruse and Steve Dettre (who nabbed a draw against Benji Batten), it was a case of too little too late. Melbourne took the win 3-0 and claimed the Teams cup, thus becoming the first team to go back-to-back in winning this event. It all shapes up brilliantly for the 2018 edition with Melbourne looking to claim a three-peat but they will face international challengers as the event doubles up as the 2018 Asian Cup of Table Football. This entry was posted in News, Tournament reports on 18/02/2017 by ajebec.